This Power Supply EMC/EMI Filter Design Workshop is unique; most other EMC seminars are hours of theory followed by demonstration on a single demo kit. 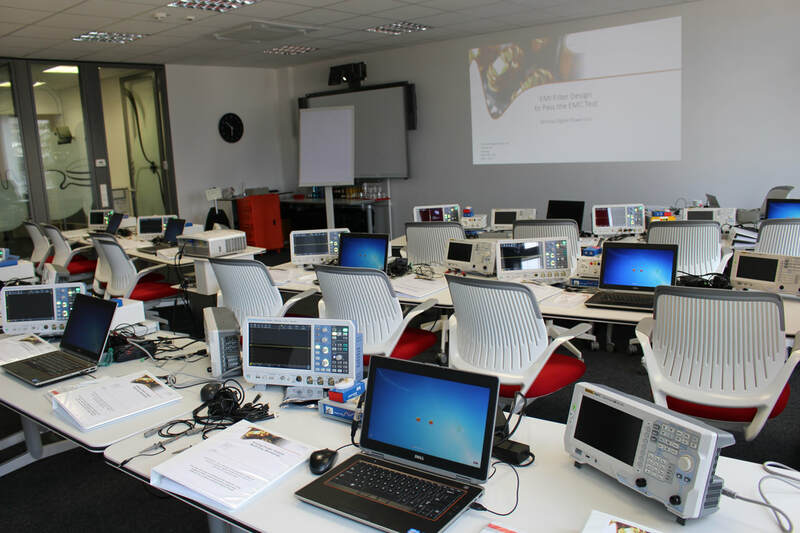 In this new workshop from Biricha we have over 300 pages of slides and hands-on labs to make sure every one get to design and then test and measure several EMI filters. Our extremely well equipped lab will have at least 10 spectrum analysers, 10 Pre-Compliance LISNs, 10 Bode 100 network analysers and 10 scopes to help you put all theory into practice in our detailed hands-on labs. By the end of the workshop you will have designed several filters down to component level and will be completely comfortable in using these equipment. We take the guess work out of passing the EMC test in this new EMC Filter Design training workshop. Each engineer will design several power supply input filters for several switch mode power supplies in a scientific step-by-step manner and work directly on a spectrum Analyser, LISN and a set of bespoke input filters to pass real conducted emission limits. Learn how to design power supply AC/DC Line filters, DC/DC and EMI filters to pass the EMC test from ground up easily in this in-depth design workshop/seminar. Gain confidence in using EMC test equipment such as LISNs and spectrum analyzers and test and debug your circuits for EMC compliance. Design RFI filters in a methodical and step-by-step manner down to the selection of the correct common mode choke or X or Y capacitors. Starting from basic principles taught during the workshop, you will be able to design input and output filters to meet the specifications required to pass the EU’s conducted emission tests such as EN 55022/EN55032 or CISPR22 . In addition to all necessary equations and step-by-step design guides for both DC-DC and AC-DC Line Filters, you will also receive a license Biricha’s new EMI Filter Design software. The workshop is 3 days long. The first day is dedicated to EMI filter design fundamentals for DC-DC input and output filters, understanding how to meet EMC directive's specifications, power supply/filter interaction and making you comfortable with using EMC test equipment. During the second day we will cover filtering needs for high power DC/DC power supplies as well as covering detailed design of Pi filters. Finally Day 3 is dedicated to AC/DC EMI Line filters for PFC driven products, step-by-step AC/DC line filter design and 2 stage filter/4th order filter design down to component l level. All material is supported with great presentations, numerous Spice simulations, filter design equation sheets of all equations and of course numerous hands-on-labs. We believe no other training in the world offers such a well equipped laboratory for EMI filter design and debugging. The attendees work only alone or in pairs at a workstation. We have a total of 10 workstations, so the total number of attendees is strictly limited to 20 engineers. The class runs from 9:00am - 5:00pm on Day 1 and 2. The class runs from 9:00am - 4:00pm on Day 3 to allow for easy travel. "A really practical course on how to design filters"
"Though this topic is complicated the workshop is easy going; I am really looking forward to the next one ;)"
"This workshop is from Engineer to Engineer; it covers a lot of background knowledge together with practical hands-on labs"
"Absolutely positive: it was free of marketing slides :) "
"One can clearly see the love and effort put in this workshop. Great job! loved it"
"Ali is a gifted teacher and succeeds in bringing complex technical challenges in a structured, well-explained way. I would recommend all engineers in the field to take the workshop !​"
"Nice Anti-Panic training for engineers who need to go to the testing house." "It was super! We learned much, easy to understand (for none-native English speaker )"
"This workshop perfectly matches theory and practice"
"Ali is my favourite presenter, he always explains questions in an easy to understand way and tells nice jokes. " The class runs from 9:00am - 5:00pm on Days 1 and 2.